From the late 1800’s into the early years of the 20th century, Indiana’s capital city had a body problem. How to protect people who were already dead? Around 1900, even supernatural visitors to the city’s cemeteries would not have been surprised to find “the quick” prowling among the dead. For decades, grave robbers and vandals regularly stalked Indianapolis’ burial grounds – until the city took bold steps to stop them. An early description of how big the “body-snatcher” problem was comes from an article in the Indianapolis Journal, published just before Halloween on October 27, 1899. The story concerns a shocking discovery at the Greenlawn Cemetery. Over 1100 Hoosier pioneers were interred at Greenlawn. Vermont-born Indiana governor James Whitcomb (1795-1852) lay there until his daughter ordered his body moved to massive, prestigious Crown Hill Cemetery in 1898. Among those who also found their first, but not final, resting place by the White River were 1200 Union soldiers and over 1600 Confederate POW’s who died of illnesses and battle wounds at the U.S. Army’s Camp Morton or in city hospitals nearby. Greenlawn, however, shared the fate of all those who came to call it home in the nineteenth century. The cemetery, too, died. Indianapolis’ downtown burying grounds faced all the normal cemetery problems, such as vandalism of tombstones by youth and overcrowding, especially after the numerous Civil War interments. Spring and winter floods on the White River were also a major factor behind its closure to new burials in 1890. But another cause also drove the city to declare Greenlawn itself “defunct”, and was far more disturbing in nature. As Indianapolis newspapers reminded their readers in 1899, the problem had been around for decades. 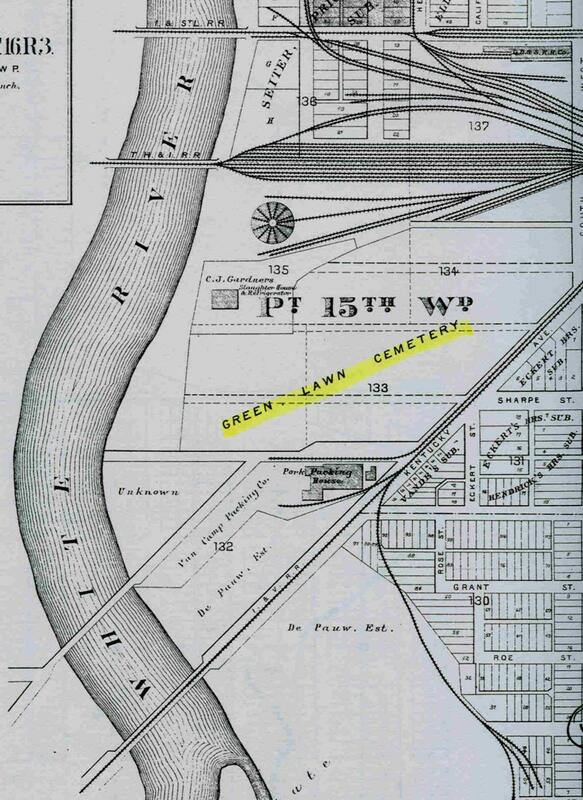 While performing some of the earliest removals out to Crown Hill, families and city officials unearthed the grisly fact that “in reality, few if any bodies” buried at Greenlawn prior to the 1890’s were still in their graves. Robbing a grave for jewels and other valuables is a tale as old as time. Preventative measures against the desecration of graves and theft of items meant to stay with the dead had actually led to the creation of some of the greatest mortuary art, including Egypt’s pyramids. Even daring archaeologists were technically glorified grave robbers. The plot of William Faulkner’s great novel Intruder in the Dust (1948) centers around a spinster and a teenager trying to clandestinely remove a body from a fictional cemetery in Yoknapatawpha County, Mississippi, to prove a man innocent. Outright theft of bodies themselves, however, was something that really only emerged after the 1500’s, when the more accurate study of human anatomy initiated the emergence of modern medical science. In the early days of modern medicine, however, the primary provider of bodies for anatomical study was the public hangman, not the grave robber. Rembrandt’s famous painting The Anatomy Lesson of Dr. Tulp shows doctors-in-training gathered around the body of a Dutch thief, Aris Kindt, who had been strung up on a rope just a few hours before he went to the dissecting table. Before many centuries were out, though, doctors began to find that live thieves were also useful. 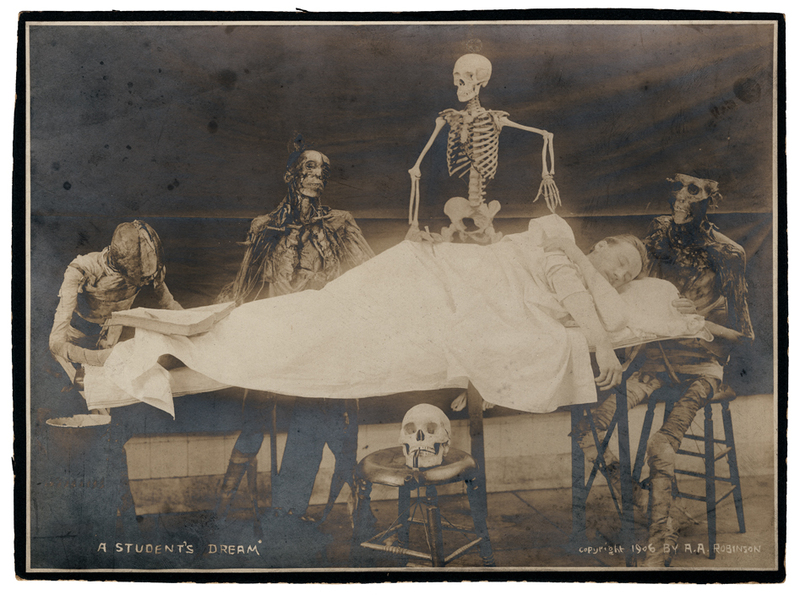 In the 1800’s, medical faculties often had trouble finding enough bodies for their students to dissect in classrooms. Families were reluctant to donate their loved ones to science. Tragically, the bodies that medical instructors typically got hold of came from the most victimized and outcast members of society. When available, corpses for the dissecting room were found at poorhouses, jails, and mental asylums, for the simple reason that those who died there had often been abandoned by their families. While many vocal opponents tried to stop the dissection of the poor, if none came to claim a body as a “friend,” medical faculties were legally allowed to use such corpses for the education of future doctors. Most states passed so-called “Anatomy Acts,” modeled on Britain’s of 1832. It should come as no surprise that the largest number of bodies dissected by medical students from the 1800’s into the 1930’s were those of African Americans. A high number of those paid or encouraged to do the grave-robbing were also black. 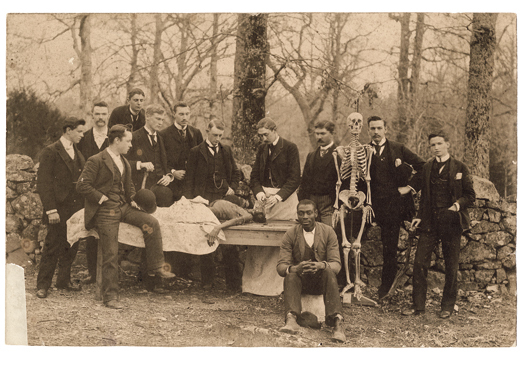 African Americans often served as medical assistants to white students, as many turn-of-the-century photographs of dissections show, but rarely became doctors then. Photography, whose own invention was fueled by a desire to accurately explore and record the human form — in a way, to cheat death — also came into the dissection room, as John Harley Warner and James M. Edmonson show in Dissection: Photographs of a Rite of Passage in American Medicine, 1880-1930. The clandestine pilfering of Indianapolis’ unguarded cemeteries stemmed from a constant need for fresh “instructional material” at central Indiana medical schools, including Indiana Medical College, the Physiomedrical College of Indiana, and Greencastle’s Asbury College (now DePauw). Indiana University in Bloomington did not offer courses in anatomy or physiology until September 1903. The Central College of Physicians and Surgeons, at 212 North Senate Avenue, was built in 1902 and immediately showed up in lurid news stories about illegal body snatching. (The college was an early forerunner of IU Medical School.) Readers of stories in the Indianapolis Journal could easily have formed an image of the college’s medical faculty scouring obituary notices and hiring thieves to steal fresh bodies as soon as the last family member left the cemetery after a funeral. One such story was reported on September 22, 1902. Mrs. Rosa Neidlinger, recently buried at Pleasant Hill Cemetery between Traders Point and New Augusta, was recovered at Central College a few days later. Investigators returned her to her husband, a miller, for a second burial. 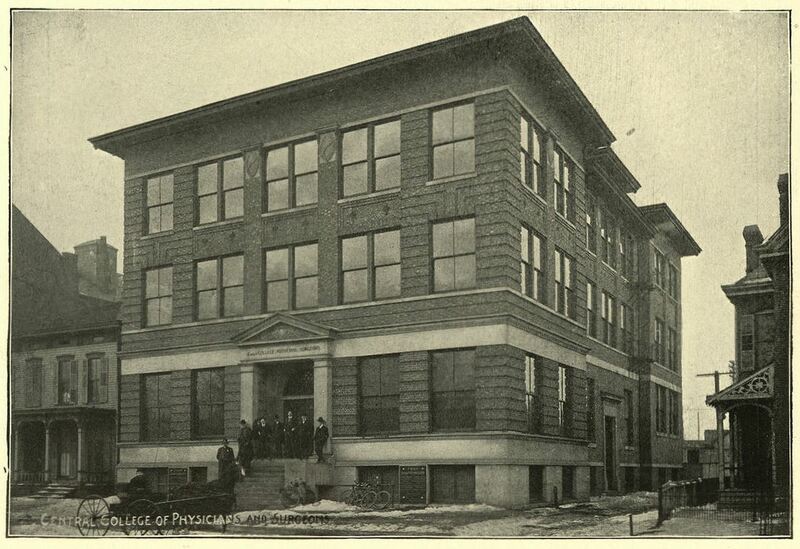 The Central College of Physicians and Surgeons was built in 1902 and sat at 212 North Senate Avenue in Indianapolis. It became affiliated with the Indiana University School of Medicine in 1906. The preferred word in newspapers for grave robbers was “ghouls” (a word that comes from Middle Eastern folklore.) At least one story shows that ghouls and their employers were sometimes caught red-handed. 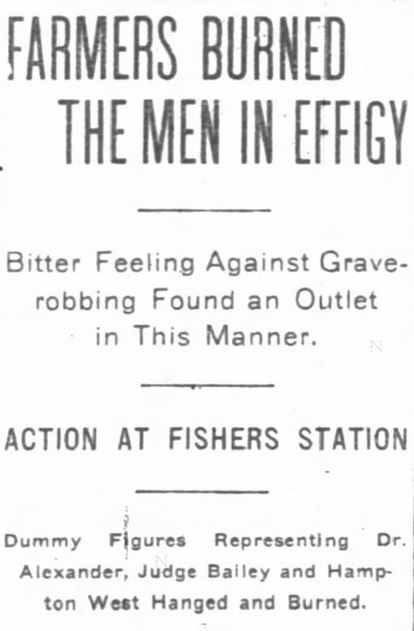 On February 26, 1890, the Journal reported that three prominent Louisville physicians had been apprehended and indicted for body-thievery at a New Albany, Indiana cemetery. Four “ghouls”, all African American, employed by the Kentucky doctors were involved. One ghoul, George Brown, was shot through the heart by policemen in the cemetery. The Journal article from October 1899 describes the bizarre dimensions of the problem at Greenlawn in Indianapolis. Families who ordered exhumations of their relatives at Greenlawn were discovering an astonishingly high rate of empty coffins — or to put it more accurately, coffins with only empty clothes left in them. No bones, no hair. Only shrouds and clothing. Were robbers stripping the bodies at graveside? At first it was customary to open a grave and take the body out, clothes and all, and either strip it naked on the ground or double it up in a sack and remove the clothes after taking it to a safe place. This practice was discontinued when one day the city was thrown into an uproar over the finding of a girl’s slipper in the snow beside her newly made grave. She had been buried one afternoon in winter when snow was falling and her relatives came back the following day to look at the grave. Between visits the grave robbers got in their work, and, following the usual custom, did not remove the clothing from the body, but doubled it up and put it in a sack. In doing so one of the dainty slippers fell from one of the feet, and, being white, was not noticed in the snow. During the following morning the snow melted and the relatives, returning to the grave, saw the slipper, and, recognizing it, raised a hue and cry. This made the grave robbers change their methods, and thereafter opening the boxes they stripped all bodies of their clothes and put the garments back in the caskets. This when related to the authorities explained why in opening the graves within the last few months nothing was to be seen in the caskets but piles of discolored clothes thrown in heaps, with slippers where the head ought to have rested. . . It has come to be generally understood by the city officials that while Greenlawn has all the outward signs of being a cemetery, there are in reality few, if any, bodies there, and that in view of this fact there should be no opposition to its being transformed into a park. The Journal writer may not have been exaggerating. Grave robbers and doctors were possibly reluctant to disturb the honored Union dead, who were removed to Crown Hill National Cemetery as early as 1866. Can the same be said of the Confederate dead? Greenlawn’s 1600 Confederate soldiers were the last bodies removed once the city decided to exhume every remaining coffin in Greenlawn for reburial at Crown Hill. 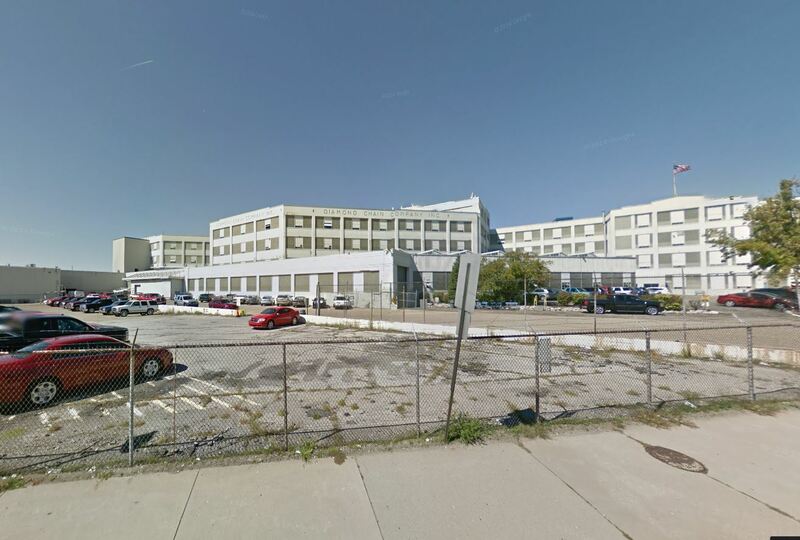 This process began in 1912, and was sped up by the fact that the area around Greenlawn had become an unattractive industrial area, which it still is today. The Confederate soldiers were left here until 1931. Buried in a damp area by the river, few of their remains likely would have survived 70 years after the Civil War. Could some of them have been sent to medical schools just after burial? 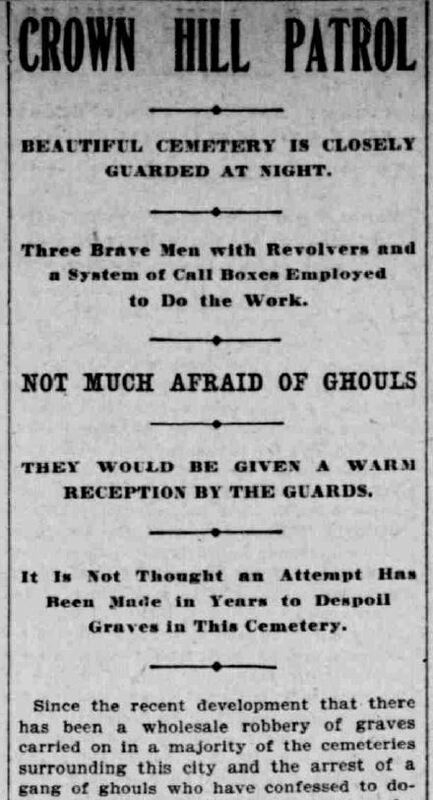 Indianapolis Journal, October 14, 1902. Hoosier State Chronicles. One of the most fascinating criminal cases in Indianapolis history is the story of Rufus Cantrell. 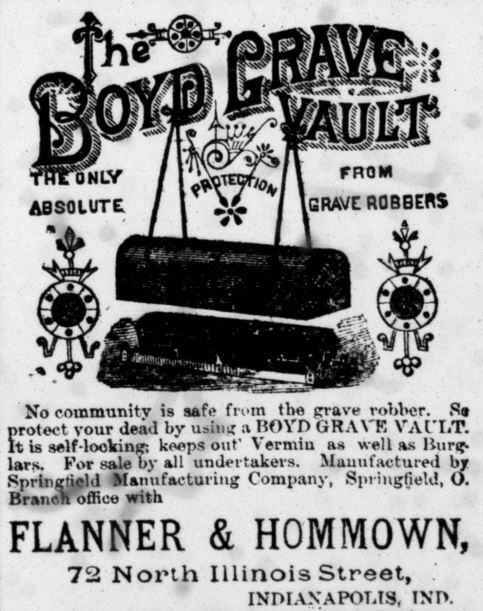 An African American who had moved north from Gallatin, Tennessee with his family and settled in Indianapolis, he was prosecuted for extensive grave-robbing in 1903. When pressed, and perhaps enjoying the media attention, Cantrell came clean, taking investigators around cemeteries all over the city where he and his “gang” had removed corpses. Lawyers tried to prove their client insane, even getting his mother to testify that he had preached and talked to God when he was a teenager. Cantrell was found guilty and sent to the Indiana State Penitentiary in Michigan City, where he “lay dying of typhoid fever” in June 1904. He survived and later was transferred to the Jeffersonville Reformatory near Louisville. Though few if any white doctors who paid ghouls for their services ever got such sentences, Dr. Joseph C. Alexander, who allegedly worked with Cantrell, went on trial in Marion County in February 1903. When the court failed to convict him, angry farmers in Hamilton County hanged and burned effigies of Dr. Alexander and the judge in the middle of a street in Fishers, shouting “Death to the grave robbers!” When they inspected the graves in a rural cemetery on what became Indianapolis’ North Side, half of the coffins there were found empty. Rufus Cantrell was even accused of plotting to steal the body of ex-President Benjamin Harrison, who died in 1901. The ghouls might not have been bluffing here. The fear that struck Hoosiers in those years, and especially the Harrison family, was great and well-founded. In 1878, there had occurred the well-publicized heist of Benjamin Harrison’s own father from the family cemetery in North Bend, Ohio. 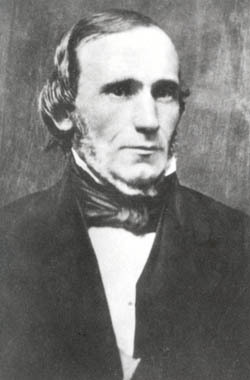 Former Congressman John Scott Harrison, son of Indiana territorial governor and U.S. President William Henry Harrison, was found hanging naked from a rope in an air shaft at Ohio Medical College in Cincinnati, shortly after his son Benjamin came from Indianapolis to oversee his secure burial in a secret grave. Amazingly, John Harrison, Jr., armed with a search warrant, had discovered his father’s body while investigating the disappearance of yet another corpse, that of Augustus Devin, a young tuberculosis victim who had been buried next to the Harrison plot just days earlier. Devin’s body turned up in a vat of brine at the University of Michigan. John Scott Harrison, son and father of U.S. presidents, was snatched in 1878. All this considered, a major factor driving the surge in burials at Crown Hill at the turn of the century was the increased security taken there to ward off robbers. Modeled on Louisville’s famous (and equally massive) Cave Hill Cemetery, Crown Hill was the resting place of most of Indianapolis’ elite. It eventually became the third largest private burial ground in the country. Body-thieving never totally disappeared. (The actor Charlie Chaplin was stolen from his grave in Switzerland in 1978.) The public also feared other reasons for desecration. When Socialist presidential candidate Eugene V. Debs was buried with his family at Terre Haute’s Highland Lawn Cemetery in 1926, no individual headstone was placed there. Though Debs’ body had been cremated, the Debs family and his supporters feared that unfriendly vandals or “souvenir”-snatchers, perhaps funded by his political enemies, would try to steal the urn. Such stories are troubling to read, but a vital part of the city’s history, involving race, science, and medicine. Ultimately, it is a strange fact, surely part of the terror and beauty of the human predicament, that many a grave robber, who almost certainly came from the margins of Indianapolis society, ultimately did help advance medicine and the public welfare.